Item Code:Sheetfed offset ink Features:Shine process colors from KINGSWOOD are manufactured to give the highest gloss and color brightness possibly today. 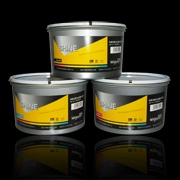 Shine process colors from KINGSWOOD are manufactured to give the highest gloss and color brightness possibly today. The true beautiful shining colors are most noticeable, and combined with excellent rub resistence, great trapping, high print contrast, intensive strenth and duct fresh. For all machine types. Stable performance for multi-color press,+15000/hour,ideally for jobs requiring highest gloss or perfecting presses. Shine comply with European color standard 12647-2, and it is certified by SGS for ROHS,EN71 and ASTM. The product is well accepted in Europe, North America and Middle East , and stand out for its high gloss, bright colors, low dot gain , quick set speed and suitable for coatings and stay open over night.